We just received the Little Innoscents Organic Range and Raedon loves it. Little Innoscents is an organic range from Australia. Little Innoscents provides concerned parents with 100% natural, Australian made and grown, baby skincare products. ❤ not tested on animals. 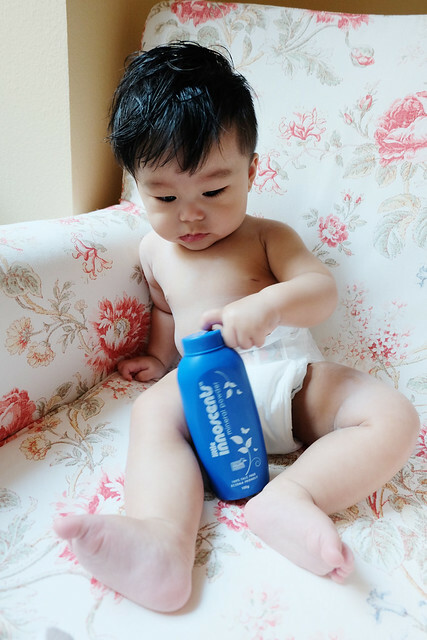 The Little Innoscents range are based on aromatherapy ingredients, which mean that they can be used on delicate and sensitive skin, providing essential skincare for babies and infants. They can be used to treat stressful skin conditions such as eczema, dermatitis and psoriasis. Their products are completely free from toxic chemicals, parabens and any other hidden ingredients. It is also the first organic baby care product to be certified by the Australia Certified Organic (ACO). Most of all, it is available to everyone at affordable prices! 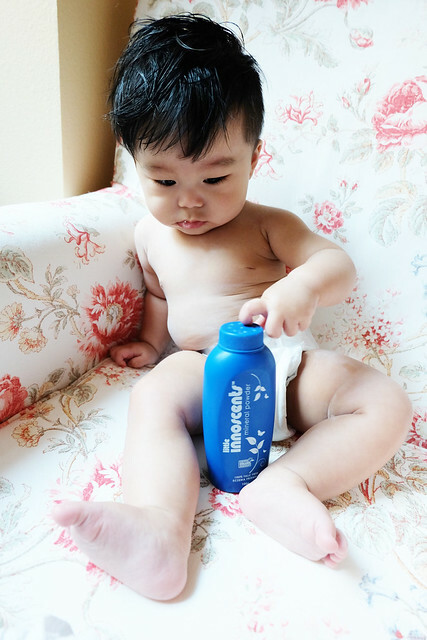 Raedon's favourite Little Innoscent product is the Little Innoscents Organic Baby Mineral Powder. He was having some rash because of the summer heat. It is soooooooo HOT here in Europe and Raedon is a baby that prefers the cold wintry months than the hot summer months. He is a happier baby when he is in a colder environment and would start fussing when he is feeling too warm. After applying the Little Innoscents Organic Baby Mineral Powder for two days and his rash totally disappeared. This product gets 5 thumbs up from us!!!! Years before the world wide trend of formulating cosmetics with minerals, Little Innoscents developed a Baby Powder made from Kaolin (Australian White Clay). This powder is a mineral derived from our very own beautiful outback and has some spectacular properties. It works almost magically to absorb excess moisture and toxins, protecting baby’s delicate skin from chaffing, odour, infection, and irritation. It also delivers minerals directly into the skin, and is made even more effective with added soothing Lavender and Spearmint. This super powered product is innovative and simply a nursery must have. Its particles are not as fine as talc, a little grainy which prevents unnecessary inhalation and stills holds excellent absorbing qualities. We also received the Little Innoscents Travel Pack. Made with essential oils that not only smell divine but also effectively treat a range of skin conditions. This is a perfect for my nappy bag and ideal for travelling. We are taking this set with us on our summer holiday to London and Paris next month. We are so excited because we are taking Raedon to the Harry Potter Museum and also to Paris Disneyland!!!! Their naturally pure and organic baby skincare products are based on aromatherapy ingredients which means they can used on delicate and sensitive skin and provide essential skincare for babies and infants. All of their baby skincare products can be used to relieve your young ones from rashes including eczema, psoriasis, cradle cap, nappy rash and more. Little Innoscents Travel Pack is perfect for travelling or as a trial set before you get the full size products! Raedon starting going to kindergarten at 6.5 months old. In Europe, babies get to go to kindergarten at 3 months old. He plays with his classmates, do finger painting, drawing, coloring, sing some songs, listen to stories together and also learn things together. Everyday, I would apply the Little Innoscent Natural Sun Lotion SPF 30+ UVA/UVB product on Raedon before sending him to school. I only dab a little of this product on his face and he likes the smell too! Say NO to nanoparticles! 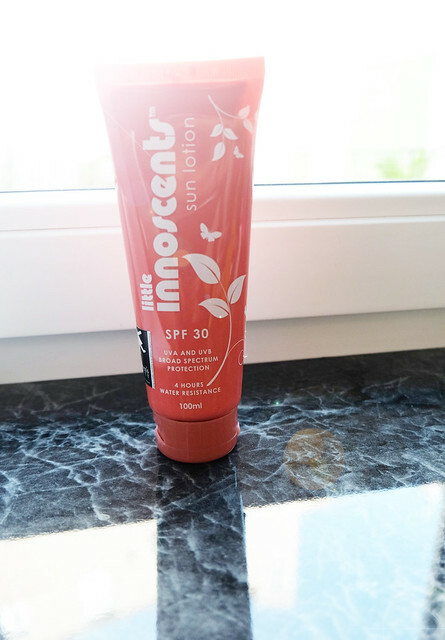 Instead try Little Innoscents lovely zinc based sunscreen with soothing Aloe Vera and Calendula with no Nano-particles making it a wonderful alternative to many synthetic products on the market. I used this only to wash Raedon's hands after meals or after his playtime. But this can also be used for his bath, but I prefer the Little Innoscents Hair & Body Wash as it lathers up better. However, this product is perfect for a quick hand wash! 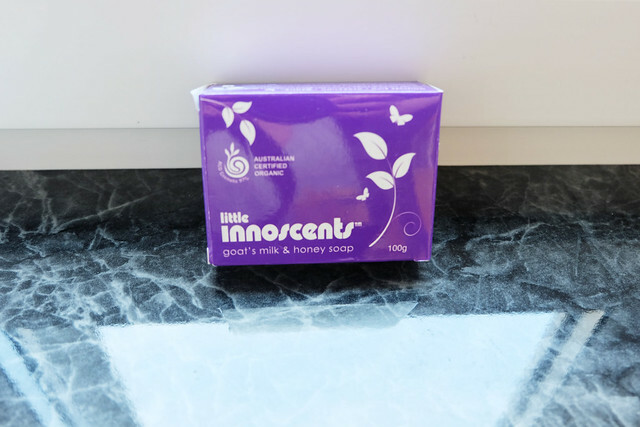 No more dry skin with the Little Innoscents Organic Soap Bar! Finished off with a gorgeous scent, achieved by blending Lavender and Rosewood Essential Oils. It’s perfect for your baby and therapeutic for those suffering from Dermatitis, Psoriasis, Eczema and dryness. Little Innoscents products are Australian made with 100% Natural, Pure and Organic ingredients. Completely free from Toxic Chemicals, Parabens and all other little hidden nasties.